If you need crisis help, click the button below. 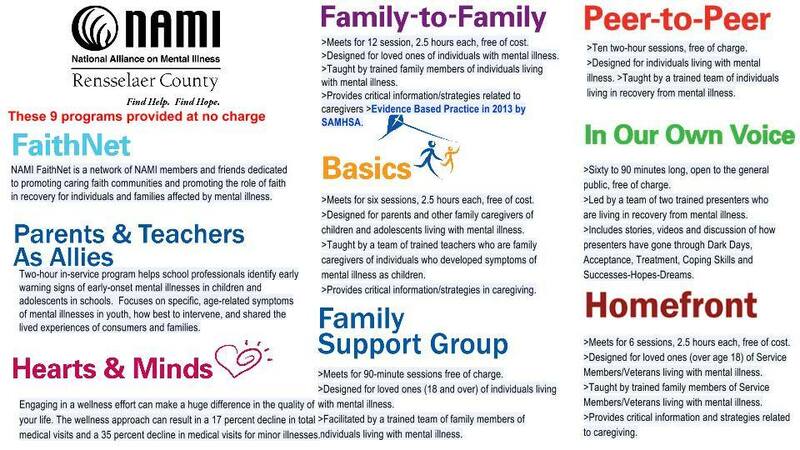 NAMI Capital Region NY programs are almost always free. Brochures and electronic downloads are also free. Donations are welcome but our priority is helping others. It’s time to talk about mental illness in our communities. Connection Recovery Support Group is a free, peer-led support group for adults living with mental illness. For more information, give us a call at 518-588-6949! “Navigating a Mental Health Crisis: A NAMI Resource Guide for Those Experiencing a Mental Health Emergency” (Crisis Guide) provides important, potentially life-saving information for people experiencing mental health crises and their loved ones. This guide outlines what can contribute to a crisis, warning signs that a crisis is emerging, strategies to help de-escalate a crisis, available resources and so much more.